In collating the amount of material for The Rambling House, we became aware of the density of material regarding superstitions, folklore and customs in the northwest of Ireland. In an effort to try and bring the full range of material to the attention of the listeners, we devised a method by which we could present as much information as possible in a short space of time that would be both fun and non didactic. 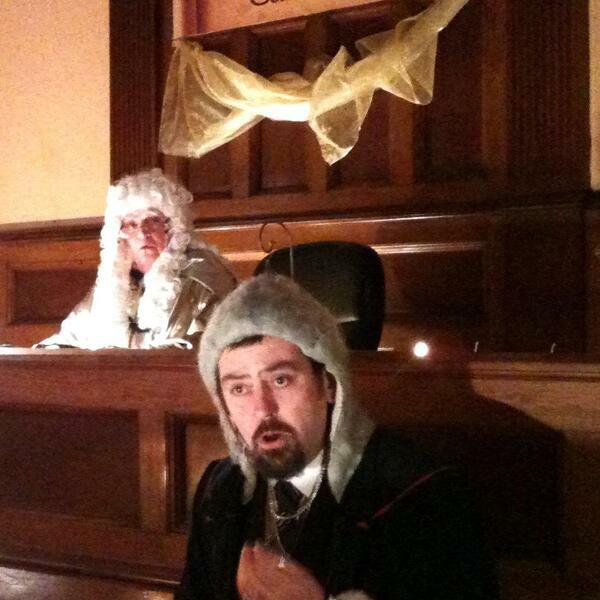 The result was 'The Twilight Court', which is a mock court trial under which superstition itself is on trial to be decided by the audience at the 'court' on any given evening. The question being asked is “is there any room in a modern age for superstitions?” A number of common topics associated with superstitions and customs are examined with an “expert witness” such a seventh son of a seventh son being cross-examined by counsel. The topics include good and bad omens, births and deaths, love and marriage, charms and cures as well as fairies and sprites. Each one is examined and counsel debates the pros and cons for Superstition for Common Sense respectively. Whilst counsel for superstition was showing how each area should be regarded as beneficial and helpful to us all, counsel for common sense emphasised some of the more unusual items and perhaps the ridiculous ritual that comes with them. Audience participation was encouraged with any tales that they may have heard on the night. There was a delightful twist in the story to keep the “jury” on their toes and the tone of the night was one of good humour whilst delving into the deep treasure chest of strange and unusual lore out there. To the passing visitor or native, 'The Twilight Court' serves a helpful resource in knowing how generations dealt with issues from warts to weddings, piseogs to pookas! We hope you enjoy this innovative medium of telling you just some of the great lore of the north west of Ireland.